When Johnsonville Sausage joins the Taste of Home cooking schools on its 30-state fall tour between September and December, attendees will be delighted by a tasty dish for the holiday season. Taste of Home cooking school attendees will learn some creative uses for Italian ground sausage in a main entree or appetizer. The goal is to expose the Taste of Home cooking school attendees to some convenient, flavorful and simple recipes they can take back with them for a weeknight dinner or special occasion. 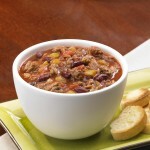 One popular recipe that reviewers rate as a five-star dish is Johnsonville’s Chiliville Chili, which takes a traditional all-ground beef recipe and instead uses a blend of ground beef and Italian ground sausage, which gives the chili an extra flavor boost. Johnsonville Italian ground sausage is available in three flavors such as sweet, made with basil; hot, made with crushed red pepper; or mild, a more traditional version. While other meats require sauces and spices to flavor a dish, Italian sausage delivers the flavor all on its own. Made with only premium cuts of pork and a perfect blend of spices, Johnsonville Italian ground sausage brings the level of quality that confident cooks are looking for when creating their families’ “keeper” recipes. Wisconsin-based Johnsonville Sausage is the No. 1 national brand of brats, Italian sausage, smoked-cooked links and fresh breakfast sausage links. Johnsonville employs approximately 1,400 members. Each member takes ownership of product quality to ensure the excellence and “Big Flavor” of Johnsonville Sausage. Founded in 1945 by the late Ralph F. and Alice Stayer, the company remains privately owned today. For additional Johnsonville company information, the latest recipes, contests and the Big Taste Grill tour schedule, visit www.johnsonville.com.